Don’t do this if you are currently reading in a public library, but if you’re not…then clap it up for Italy. The 4 clubs representing Italy all collect 4 wins while only suffering 2 collective goals and scoring a total of 11. The revolution is coming as Serie A begins to regain its hold on Europe. Before you know it, the Italian National team will rally behind it on International weeks and I am on board for the ride. Congratulations to the Italian clubs and their respective fan bases, and a big Congrats to the Italian people. Juventus and Roma shut out their opponents while racking up the scoresheet on their home grounds on Tuesday. Paulo Dybala (Juv) and Edin Dzeko (Rom) each netted a hat trick for their clubs. Those were two one-side yet entertaining matches. Napoli and Inter scrapped, fought, and found themselves to be the recipients of the “Hard work pays off” trophy as Inter rallied from their 1-0 losing start to Eindhoven to win 2-1. Napoli put so much pressure on Liverpool and finally broke through with a late 1-0 winner in the 90th minute from Insigne. A much-needed win for newly appointed Napoli boss Ancelloti. Okay, So Italy is good. Whose bad? I wouldn’t count 0-2 PSV Eindhoven out just yet either. They fought hard against Inter and I still believe they can collect 6 points against the Spurs in the next two matches. They’ve played the second best in the group so far in terms of quality and control. They just need to step up the hunger factor against the Spurs. Hopefully, the next 3 matches they can get in form for the last match against Barca, who might not play all their starters on matchday 6. In my last article, I mentioned how Bayern Munich were underwhelming. That was the nice way of me saying “over-rated”. I like this team. It saddens me to see the likes of Ribery and Robben bring it down because of their entitlement by seniority. These are old players in a new game trying to dictate playing time over their manager. This back-and-forth has been reported by many European papers and the negative emotions it causes is starting to play out on the field. They’re Mourinho with cleats. Speaking of Mourinho, can’t get it done at home against a Spanish side. No surprise there. The de-evolution of that team is a sad story as well but I won’t dwell on it. Then there is Real Madrid going down 1-0 at the opening in Moscow. Everyone and their grandmother were on their phones live betting Real Madrid to win since the odds probably went up in a favorable value. That Madrid -1.5 was oh so juicy. But I did not buy into it. This Real Madrid team is not the Real Madrid team that dominated the Champions League the last 5 years. They would lose this game trailing for 88+ minutes. This team is looking for a personality. They couldn’t get it together in La Liga when they lost 3-0 at Sevilla and split points at home with Atleti this past Saturday. Los Blancos Manager Lopetegui has a long way to go. Barcelona. Duh. They travel to London and took down the same Tottenham we watched from last year. Raise your hand if you thought this game would end in a Spurs win….don’t feel ashamed if you did. Spurs fan are no different from Gunners fans…it’s their year until reality settles in. Messi is back to doing Messi things. He is looking to take Ronaldo’s goal-scoring record as a show of good faith to the UEFA community. PSG played a statement game after going down to Liverpool in the opener. That was no surprise. However, Liverpool ‘s loss to Napoli was quite the surprise. Not that the Napoli win that was surprising, it was Napoli’s 9 shots (4 on target) to Liverpool’s 3 (0 on target). Sounds boring right? Imagine the Red’s fans watching Napoli play the entire game on attack while Liverpool defended and surprisingly had 45% of possession. I guess the time to take free kicks and goal kicks counts for Liverpool’s possession times. 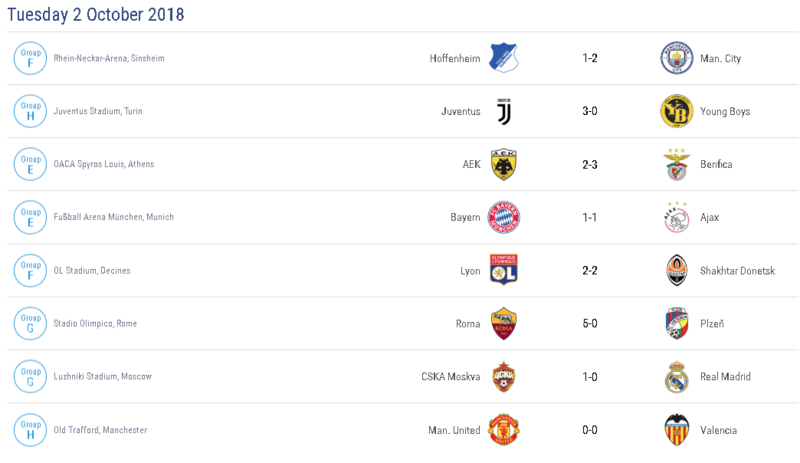 Porto and Schalke got the job done this week. Unless you are a fan of any team in group D, then the interest in this group isn’t all that great. Many don’t see these teams making it to February. Group F is up for grabs now. 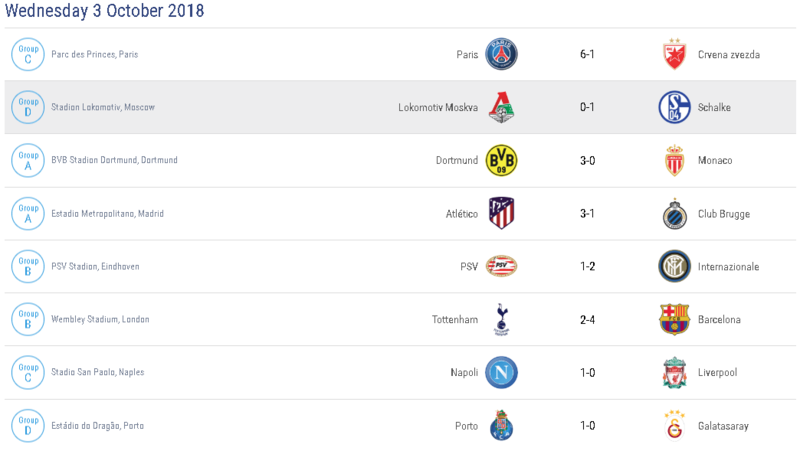 At first glance you would think Manchester City and Lyon are going to walk away with it but City are barely winning games. Lyon looked shaky against Shaktar who always seem to score enough goals to please the Over betters. I do not have a clue where this is going but that’s the beauty of football. That’s my analysis…no clue. Roma’s taking group G. They own it. I can’t wait to see what they do when they play Real Madrid on the double. Referees will be blamed for everything as usual.